The Rose Center has a fully equipped Pilates rehabilitation & fitness studio and is offering mat classes, individual and group sessions. This method of exercise is effective for treating patients including those with scoliosis, osteoporosis, back injury and stroke patients, as well as anyone wanting to improve their overall fitness. Exercises are performed on apparatus designed by Joseph Pilates which evolved from the Pilates' original mat work. On the apparatus, springs and gravity are used to challenge and assist motion to achieve successful movement. "The Attainment and maintenance of a uniformly developed body with a sound mind fully capable of naturally, easily and satisfactorily, performing our many and varied daily tasks with spontaneous zest and pleasure." The founder, Joseph H. Pilates, dedicated his life to become physically stronger after suffering a multitude of illnesses. His experience led to this method of physical and mental conditioning. 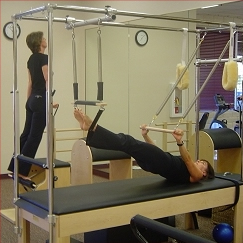 Pilates is tremendously effective for rehabilitation. It allows and encourages early movement in the rehabilitation process, reintroduces movement with non-destructive forces and speeds up the healing process.